There was a time when human beings used to note down their tasks on a piece of paper. The paper was popularly known as a checklist. After jotting down the tasks on paper, the person carrying the paper would update the list periodically via a pen/pencil to mark the task as completed. There were several advantages and disadvantages of using this method. As the time passed by and as new technologies and gadgets like computers, tablets, and powerful Smartphone evolved, the traditional method of noting tasks on paper was replaced with some better techniques. The newer techniques involve using computers, phones, and other smart devices. The computing devices run the software for us. We use the software’s features to use and manage/organize our daily tasks. Depending on the platform, there are several top class to do list applications available for free download. Today, we’ve covered the best to do list apps for the Android and IOS OS. GTasks is a free offline to-do list app with basic features. With this application, you can sync with Google Tasks, Google Calendar and other tasks related data from your Google account. GTasks has a cool light color theme. The to-do list app allows you to order the tasks by date, name or time. It also includes a search option for finding tasks. GTask comes with an Android widget that displays your most important tasks. GTasks lets you add multiple tasks in one go. It allows you to transfer pending tasks to the Tick-Tick to-do list reminder app. Likewise, you can import your to-do lists from the Astrid app. You can share your tasks with other users with GTasks app. ColorNote is an app that allows you to assign different colors to the notes you create. Due to its easy to use interface, you can add a to-do list, grocery shopping list, and checklist for your day to day task quickly. You can even sync, set passwords, search for the notes/reminders and set reminders for your tasks with Colornote. This application lets you backup your notes and to-do lists to the MicroSD card. You can link your notes with the calendar. ColorNote enables you to sort notes and checklists by modification/creation time, name, color, and reminder time. 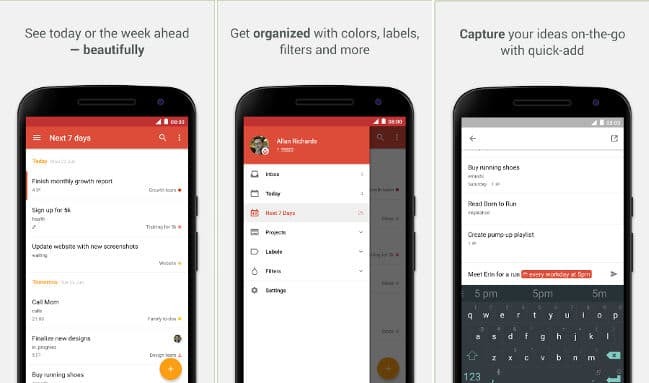 Todoist is a popular to-do list app for Android and IOS devices. The application requires you to register an account before you head over to it main interface for creating tasks. The Todoist app lets you filter notes by their priority, users, due date, etc. It allows you to prioritize and categorize notes. This application lets you see the pending tasks for the coming week. It has an activity log section where you’ll find your recent activities. With this to do list app, you can add tasks to projects and assign the projects to other users. The Todoist Android app features a notification panel where you’ll find alerts. It also includes a search utility. 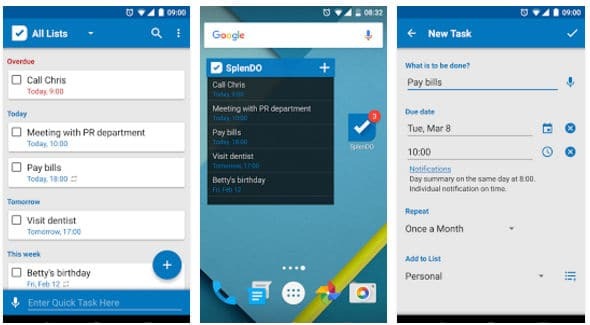 Splendo is a smart to-do list app for Android that allows you to create tasks with your voice. It makes you aware of due tasks via a push notification, vibration or sound. This application has the option to mark a task as recurring. It lets you sync your lists with the Google Tasks service. Splendo enables users to group their tasks in various categories. It provides a list and icon widget that displays the number of due tasks for the day and the list of upcoming tasks. Splendo lets you share tasks with a user on WhatsApp, FB or any other app. This app has a task filter utility built-in the top bar. The WunderList app allows you to create and manage 1000’s of to-do lists for free. It can sync your to-do lists with various computing devices. The app enables you to create due dates for tasks. It lets you set reminders as well. WunderList allows you to add PDF files, photos, notes to any task. This to-do list app comes with a special feature called activity center that keeps a track of user activity in a log file. WunderList comes with a smart list feature that allows you to prioritize tasks and assign them to a user. It lets you bookmark a to-do list. You can configure WunderList to hide or show the completed to-do lists. The app lets you set a custom background picture for the to-do list interface. To see the reminders on a wearable device, you can pair WunderList app with the device. WunderList lets you add a widget to the home screen. The app enables you to change the color of the widget. You must create a WunderList account to use the WunderList app. You can also log into the app with your Microsoft, Windows or Facebook account. Any.do is a powerful to-do list app which you can use on iPhone, Android device, Chrome (through extensions). Any.Do has a great interface. With this to-do list app, you can add tasks for any day. This app supports cloud sync and Android gestures. Any.do app features an interactive short tutorial that makes users aware of the app features. This application allows you to add a subtask for a task. It lets you set reminders and categorize the tasks. It enables you to attach notes to the tasks. You can embed pictures, audio files, videos, documents in the notes. Any DO app allows users to import important events from Google calendar. It has a calendar interface through which you can see tasks that were created or completed on a specific date. Any.Do comes with an inbuilt speech recognition engine. Because of its intuitive features, AnyDo has been featured in the New York Times. The to-do list apps we’ve mentioned above work great. You should use them if you’re searching for an application to manage tasks on Android. Next articleHow to earn money from classified websites like OLX, Quikr? Which is the best, Any.do or Wunderlist? Once selected one of them it would be difficult to switch to the other. Also can you link me to the best apps to be highly productive in professional as well as personal life?